Barclays: Trade Wars Are Economically Costly But "Smart Politics"
In a note published overnight, Barclays explains what may be the primary motivation for Trump to keep pushing through with his desire to impose import tariffs despite getting substantial pushback from both Republicans and (now former) members of his advisory circle. As Barclays strategist Aziz Sunderji notes, amid declining employment in manufacturing and stagnant wages, a portion of the American electorate has become more skeptical toward free trade, and as a result "Politicians from both parties have channeled that skepticism." Aziz then notes the asymmetrical gains/losses that make declarations of trade wars often times desirable: according to the Barclays strategist protectionist rhetoric can be a useful political strategy, because while the benefits of free trade are widely dispersed among many, the beneficiaries are likely to protest only mildly to protectionist measures. Meanwhile, the costs of free trade tend to be acutely borne by a few, with whom protectionism resounds strongly. It is this relatively modest group of people that Trump is targeting. President George W Bush raised tariffs on steel, too, but as his trade representative Robert Zoellick explained, these were used merely to create coalitions and manage political support in the US amid a broader move toward increasingly free trade (see “The US Admits That Politics Was Behind Steel tariffs”, New York Times, March 2002). On the other hand, antipathy toward free trade is especially strong among Republican voters. Only 36% agree that free tree trade agreements have been good for the US, down from 57% in 2009 (Pew Research Center). So going back to Trump's thought process, Aziz argues that having achieved some success elsewhere in his agenda (tax cuts, deregulatory efforts, conservative judicial appointments), "the president may now be willing to engage in more controversial measures such as tariffs." In the case of steel and aluminum, the president may be emboldened by the Commerce Department’s report that justified tariffs on economic and national security grounds. This strategy may not work, though. 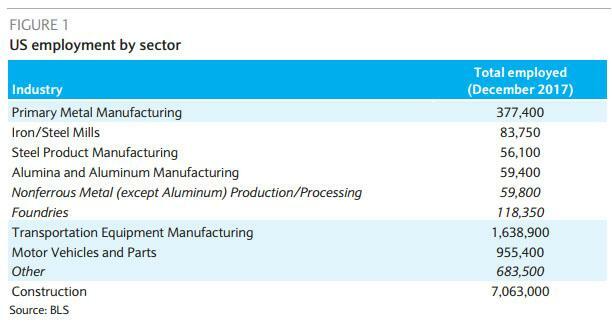 The steel and aluminum manufacturing industries are smaller employers than the industries that use these metals as inputs (Figure 1). Barclays concludes that Trump's strategy may backfire in the long run, and over time, "tariffs may be deleterious to regions where Trump enjoys strong support. Indeed, many Republican leaders have urged the president to reconsider." 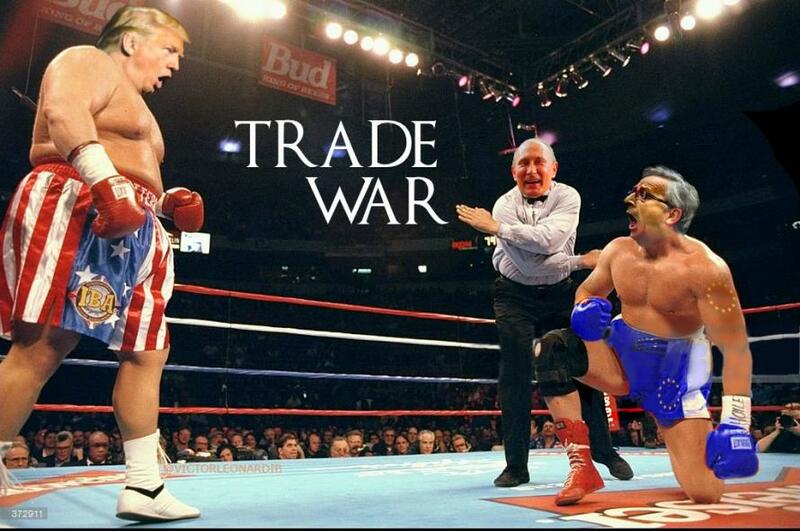 A single round of tariffs and foreign retaliation does not constitute a trade war. For that, further measures from the US would be needed. We think President Trump likely favors such further measures. We think this for two reasons. First, because of the political considerations we described above: the unpopularity of free trade among his political base and his apparent view that these actions will help the GOP in the November mid-term elections. Second, due to the economic reality that, amid fiscal stimulus from the tax cut and higher budget caps heating up the domestic economy and boosting imports, the US trade balance is likely to worsen. The president has faced substantial friction on these tariffs within his party. However, in terms of domestic law, the president has wide-ranging powers to restrict trade unilaterally. Any president can, through executive authority, impose unilateral sanctions on any country that violates trade agreements or engages in other “unfair” trade practices. The definition of “unfair” is subject to broad interpretation, as the law is designed to give the president considerable discretion. In terms of international law, protectionist measures the US takes can be challenged at the WTO. President Bush’s steel tariffs were ultimately reversed after trading partners mounted such a challenge successfully. But these take time, and WTO rulings have sometimes been ignored. Furthermore, President Trump could continue to levy tariffs on national security grounds, which have not been challenged successfully in international courts. The good news is that, if this morning's press reports are correct, the speculation over either the announced tariffs or the imminent retaliation won't take too long as Trump is said to formalize the first round of the trade wars tomorrow. Whether or not this proves to be a prudent and tactical political move remains to be seen.